Russian PM Vladimir Putin has promised relatives of victims of an explosion at a Russian hydro-electric power plant 1m roubles ($30,000) each in compensation. The death toll from Monday's blast at the Sayano-Shushenskaya plant in Siberia now stands at 47, with 28 people missing and assumed dead. 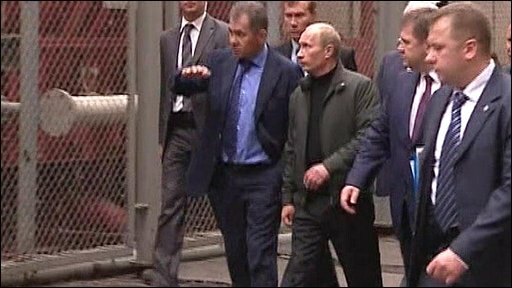 Mr Putin visited the site after calling for a major review of the country's strategic infrastructure. The cause of the blast remains unclear and an investigation is continuing. There have been claims from Chechen websites that Islamist militants were responsible for the blast at Russia's largest hydro-electric plant. Those suggestions have been rejected by Kremlin sources as "idiotic", and investigators have reportedly found no traces of explosives at the site. 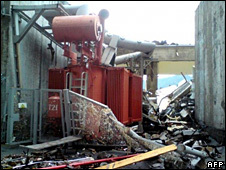 Previous reports suggested a transformer exploded during repairs, destroying three generating units and leading to the flooding of a turbine hall. Earlier the plant's owner, RusHydro, pledged to pay 1m roubles to the families of the 26 workers who had been confirmed dead at that stage. But during his visit Mr Putin said such payments should be extended to relatives of those who were still missing. "We can see what's happened, let's not pretend," he said. "I've just talked to the rescue workers. They have seen it all but say that nerves fail them [here]," he added. Mr Putin compared the state of Russia's infrastructure today to that of a wartime frontline, and promised to match the company's payouts with government compensation. Although more than 1,000 rescue workers are still scouring the damaged turbine hall and its surrounding area for survivors, most say the chances are minimal that anyone could survive for four days in the near-freezing waters of the Yenisei river. Russian Emergencies Minister Sergei Shoigu said it would take at least a week to assess the damage from the blast, adding that repairing the turbine hall alone could cost 40bn roubles ($1.3bn; £762m). But he said it would still be worth doing the repairs, because the dam - undamaged by the blast - had accounted for 80% of the construction cost. RusHydro said the damage would run into "billions of roubles" and take several months to repair. Some 40 tonnes of transformer oil leaked into the river after the explosion, killing fish and raising fears of chemical pollution. Situated some 3,000 km (1,875 miles) east of Moscow in the remote mountain region of Khakassia, the Sayano-Shushenskaya plant is expected to remain closed for some time. One of the world's largest hydro-electric plants, its dam is 245m (800ft) high and stretches 1km (0.6 miles) across the Yenisei river. Opened in 1978, the station provides a quarter of RusHydro output and is a major power supplier to at least two smelters owned by United Company RUSAL, the world's largest aluminium producer.